13/17 Jul 2018. I repeatedly wondered how I’d be describing Podyjí National Park and its highlights without pointlessly and exaggeratedly droning on about them. I soon came to the conclusion that there’d be too many spots to talk about, and that recounting each and every one in details would be too demanding of both the kindest, most accommodating hypothetical reader, and myself. So I thought I’d recollect my Podyjí highlights in a more casual fashion, and that listicles would serve such purpose particularly well. I’m not particularly fond of Snow White. And, my (long) list of fears doesn’t really feature being alone in the deep of the woods. Yet, throughout my Podyjí visits a kind of eerie feeling crept over me a couple of times. I blame it on two factors, mostly. The first is the wind. On my first hike around the park it was quite windy the whole time. Now, the sound of leaves rustling and swishing on tree branches is soothing and pleasant to hear. The somewhat sinister creak of slender trunks banging against each other, though, unique as it may sound, does have a kind of alarming feel to it, especially after the ‘a-tree-has-just-fallen-across-the-path’ Pálava experience. In fact, a couple of times I did run stretches of forest trail when the wind blew hard and the trees kept hitting violently against each other. The second factor is ‘The Unknown’. On previous hikes in the Brno/South Moravia area I was usually close (or fairly close) to the nearest town or village most of the time, or I bumped into hikers and walkers on a regular basis. Neither of these conditions applied around Podyjí. In fact, slowly but increasingly I grew aware of how actually huge the park was, and how utterly and completely alone and isolated I was the whole time. 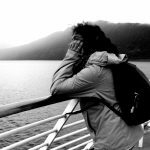 I barely ever bumped into anyone along the way – which also made for one of the closest encounters with nature I have ever experienced. It just felt slightly disquieting from time to time right there and then. But uniquely so. This is objectively one of my favourite bits to recount. I’d just got out of the woods somewhere between Andělský mlýn and Podmolí. 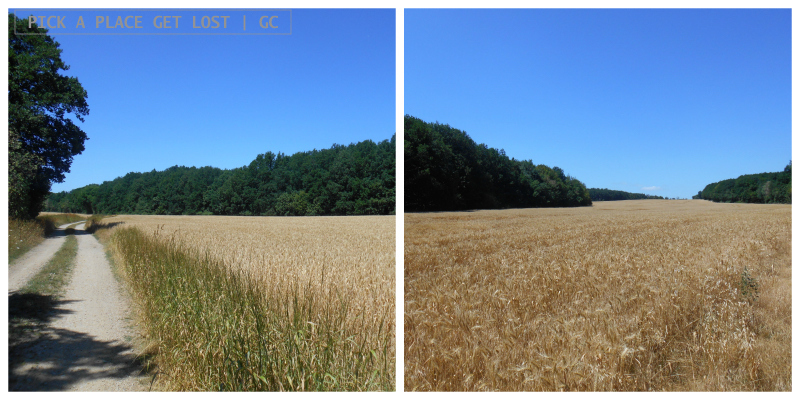 I found myself strolling down an earthy path, flanked by thick forest on the left and the largest wheat field in the history of wheat fields on the right. Suddenly, out of the woods zoomed a kid on a bike. He stopped right in front of me. He was probably 11 or 12, a black helmet covering his blondish hair. He muttered something in Czech, way too fast for me to catch it. ‘Hey, are you lost?’, I tentatively asked in Czech/Slovak. He said yes. ‘Okay, are you looking for your parents? Do you know where they might be?’, I continued. He replied in Czech, but again, too fast for me to follow him. ‘Okay, I don’t know which specific place you’re looking for, but see, just over there there’s a whole set of signs, it might help you…?’. Could I be any more socially awkward than that? He had a vaguely puzzled look on his face (which I can’t blame him for). He muttered something in reply, and then mounted on his bike and pedalled away as fast as he could. Oookay, kid. I resumed walking. Shortly after he’d disappeared into the woods, I heard him call out (in Czech): ‘Daaad!’, ‘Daaaaad!! !’, ‘DAAAAAD!!!’. Seriously, it went on for a good ten minutes, the shouting growing more and more distant as the kid (probably) cycled on through the forest. ‘What the…‘, was all I could think about. What should I do? Chase after him, find him and help him reunite with his family? But how am I going to find him again now? Plus, he has a bike, he’ll be moving much faster than I can walk. I wouldn’t know where to start anyway. So I stood there like frozen for a few minutes. I stared at the spikes and pondered. The shrieks eventually subsided and there was silence again everywhere. I walked on. I still don’t know whether I did the right thing by not going after the kid. In fact, to some extent I’m sure I didn’t, though rationally I can’t help thinking I had no other options right there and then. But it was somewhat sad. And somewhat creepy. Mostly sad, though. I could tell I was being overly cautious and wary as I got off the bus in Lukov and followed the ‘Čižov’ signs toward the fields. 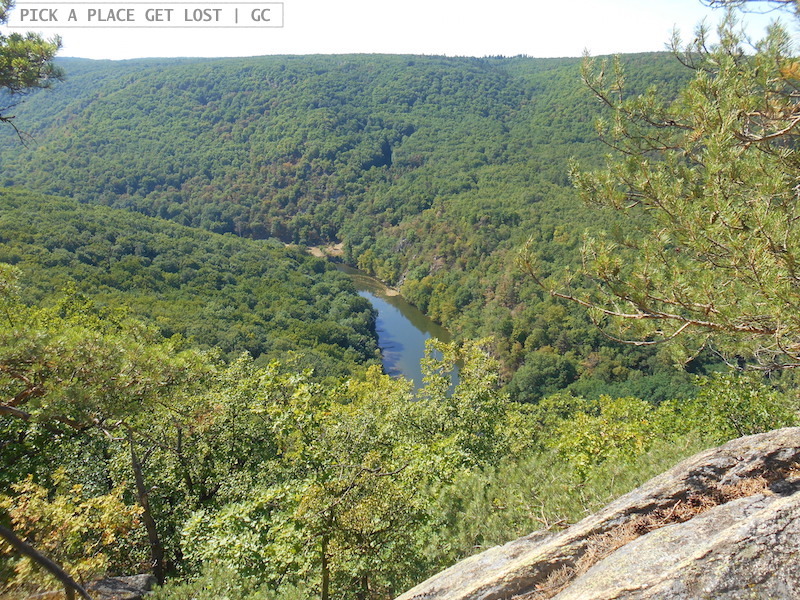 The map clearly stated I was doing it right, yet I couldn’t help wondering why no one else was picking the same path. 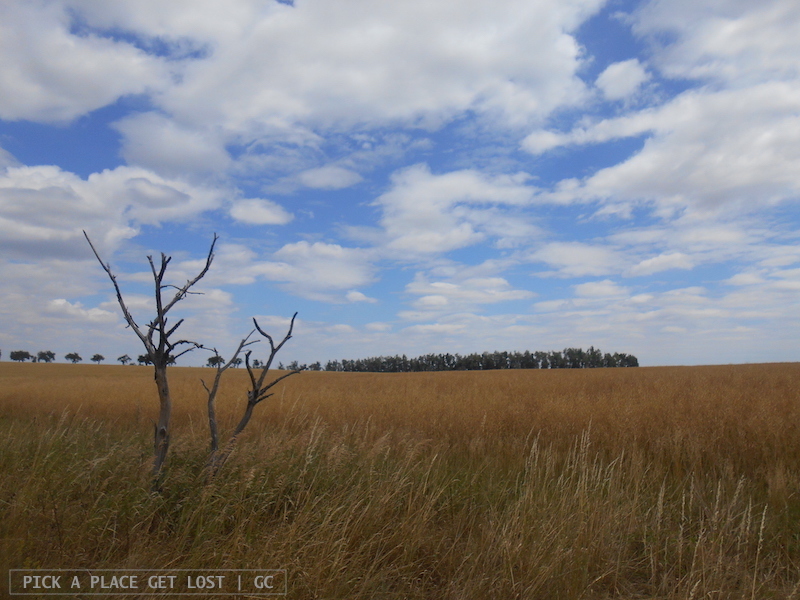 I reached the open field, stood there and honestly felt lost for a good twenty minutes or so, so much so that I feared I’d have to go back to Lukov and pick a different, better-marked trail. 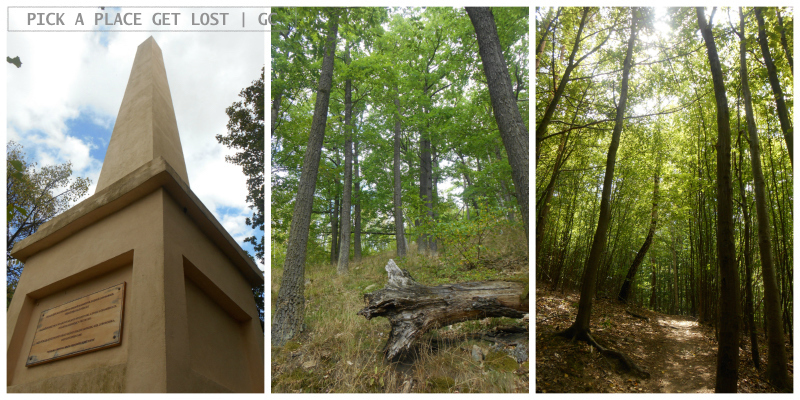 There were no signs around there, and the trail leading up through the forest didn’t look about right. 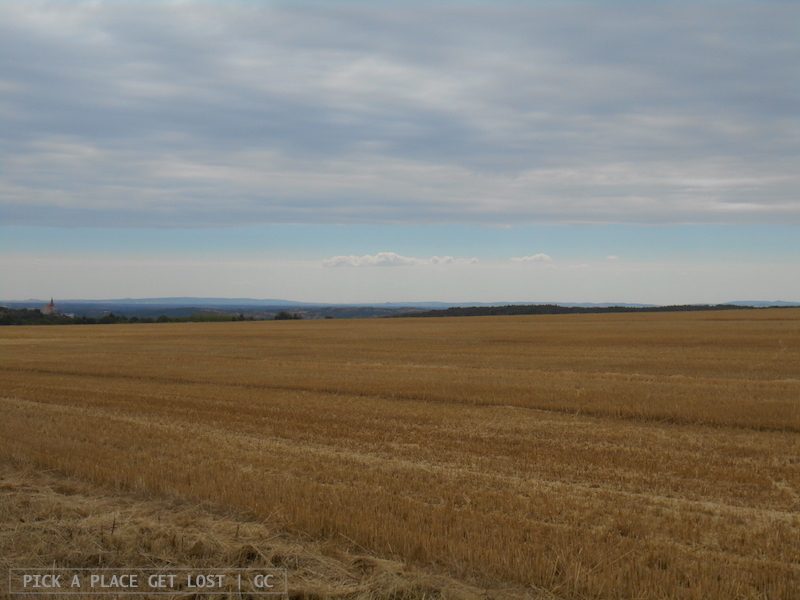 I made an attempt to follow it, but eventually resolved to walk back to the field instead. Suddenly I heard a swooshing noise coming from the wheat fields, so I turned around and, whoa, something like a deer was hopping across the field! I could only glimpse it for a bunch of seconds, as it only briefly emerged from the spikes. Plus, it must have been around one o’clock, and the sun was high, and that, coupled with the heat and the brightness of the field, made it hard to stare at it for too long. I eventually spotted a bright orange arrow sign sprayed on a wooden plate in the distance. 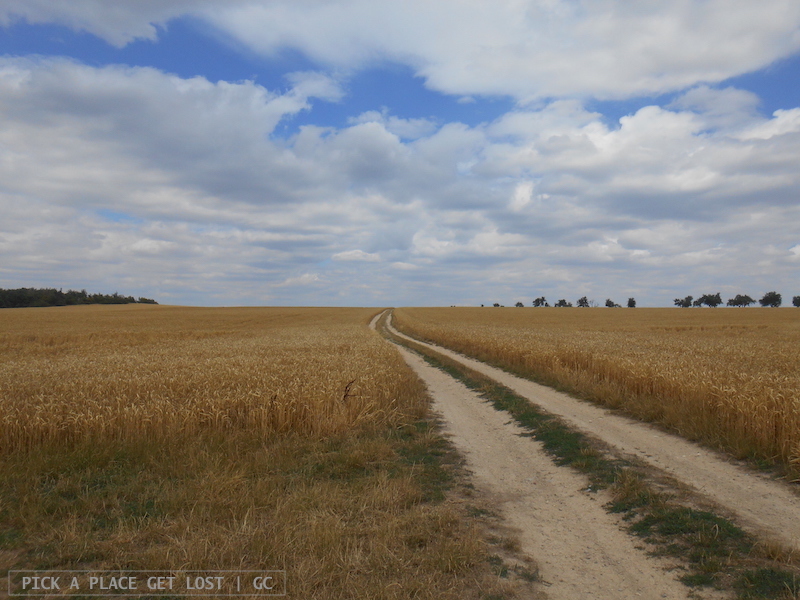 I cut through the field and finally realised I’d found the actual trail to Čižov! As I walked on through the woods, silence is what struck me the most. I soon realised I was trying to be as inconspicuous as I could and move as noiselessly as I could. I didn’t want anything to disrupt The Perfect Silence, let alone my own steps. 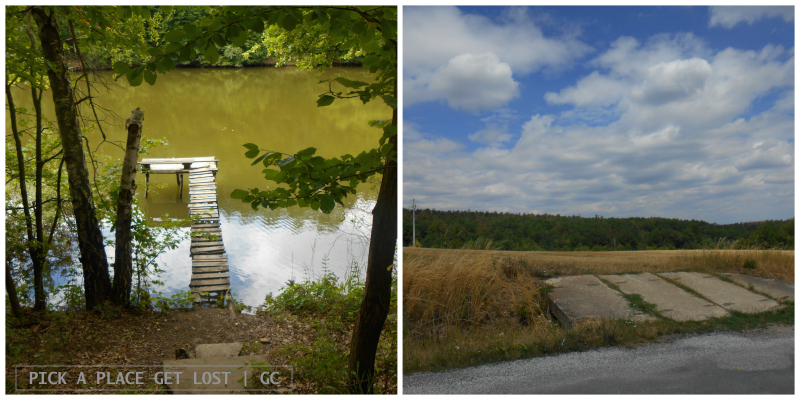 I came across a round pond at some point, then a paved road, which the signs told me to follow uphill. There I came across the ‘Welcome-to-Čižov’ sign. It felt almost unreal. Beautifully unreal. Not one soul in sight along the way. Like when you show a friend a photo of a place you visited, which you loved and are super excited about, and your friend goes ‘Ooh nice!’, smiling and nodding in assent. And you think to yourself: ‘Nice?’. Seriously, did you just say ‘NICE’?. How about ‘mindblowingly amazing and utterly breathtaking, wooow’? Because adjectives matter, that’s why. Kralův stolec is the first ‘hotspot’ I came across upon entering the park. 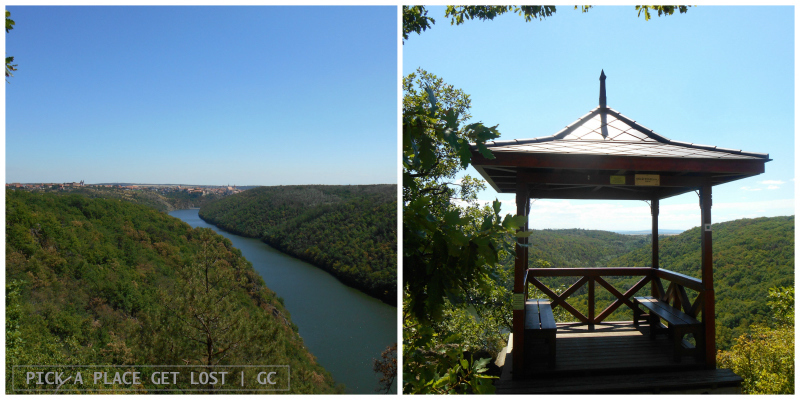 At least, I grew to believe that when I saw that both the map and the signs marked it as ‘panoramic viewpoint’ (‘vyhlídka’). I didn’t even know how I would know I’d reached it, nor was I sure what to expect of it. Well, after a few kms through the woods the trail leads up to a small, rocky clearing marked by a wooden gazebo and labelled ‘Kralův stolec’. There you go. You have to reach the gazebo and stand on it to get the full view. That is also when amazement kicks in full blast. Kralův stolec makes for The Perfect View. The Dyje waters flow glistening and blue in between the hills, whose perfectly green profile shapes the landscape all the way to the horizon. Just there, as if specially placed on top of them, Znojmo peeks out over the hills, its urban profile hardly mistakable despite the distance. Any additional remarks about the view would be redundant. Go see for yourself. Really. ‘5.5 km’, read the yellow sign by Pod Šobesem. That’s how far Sealsfiedův kámen was from where I was right then. That, plus another 6.5 km back to Znojmo castle. It was around 3 o’clock when I came across the signs at Pod Šobesem, and knew instantly Sealsfiedův kámen would be my next stop. It was marked by the ‘viewpoint’ symbol on the map, how could I miss out on that. The first 2.5 kms or so consist of flat, earthy ground, and take you through the woods and along the river (whose rocks underwater look bright red from a distance). Then the trail grows steeper and steeper, rockier and rockier, but as the trail goes uphill, so increasingly grows anticipation. Just when you think you’ve got used to the trail, eyes glued to the ground to avoid tricky, pointed rocks, you will notice that the path grows flatter and broader. That’s a good time to look up, because you will realise you’ve reached the top. 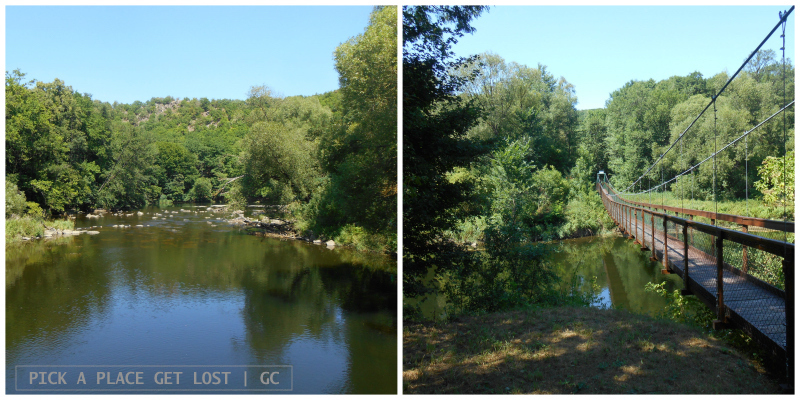 I can quite positively say that Sealsfiedův kámen is My Favourite Podyjí Spot (with Kralův stolec close second). It’s hard to find suitable words to describe the view. Even adjectives like ‘mindblowingly amazing and utterly breathtaking, wooow’ fail to convey the full extent of the amazement it triggers. Blame it on the sea of hills, whose green slopes stretch out in the distance as far as the eye can see. Blame it on the river, meandering at the bottom, as if shaping the landscape. Also blame it on the sky, whose flat blue made the leafy hill slopes look even crustier and bulgier. Piece of advice: pick a rocky spot (or sit on the wooden trunk bench you find there), and stare ahead for as long as you deem necessary. Any list of Podyjí’s key points of interest most probably features Ledové sluje, and rightly so. To reach the site you have to (literally) ‘go the extra mile’ off the main trail to Vranov, but the view is more than worth the detour. Ledové sluje is located in the western part of the park, so I went there on my second Podyjí hike. The hilly view from the top is potentially very similar to that from Sealsfiedův kámen. The still, cool-ish air and the white-clouded sky, though, painted a wholly different, equally beautiful, picture. The viewing spot is quite narrow, squeezed between the forest, the wooden fence and the yellow obelisk commemorating ‘illustrious’ (‘nejjasnější’) Helena Mniszková, countess and true, dedicated Ledové sluje lover. 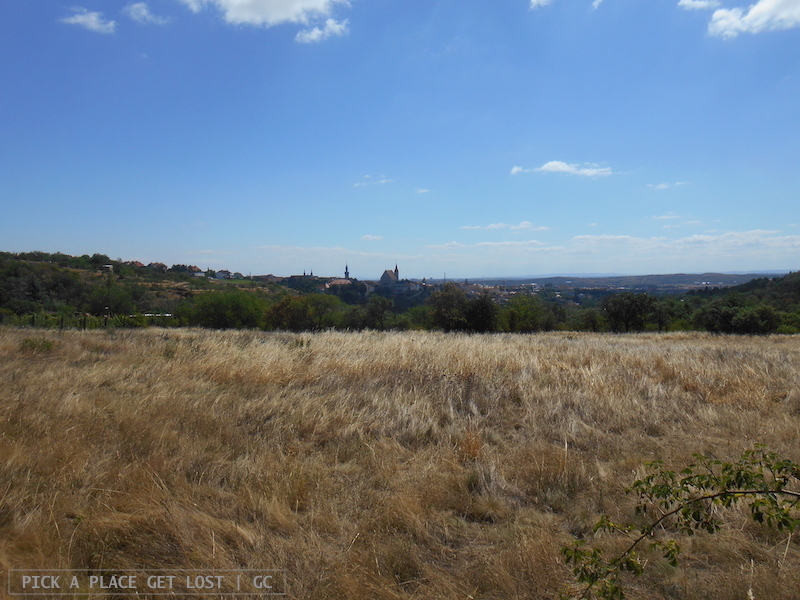 One second you’re walking past St. Hippolytus’ Church up Hradistě, and the next thing you know is you’re strolling down an earthy path flanked by vast expanses of dry, yellowish grass. How did this happen? 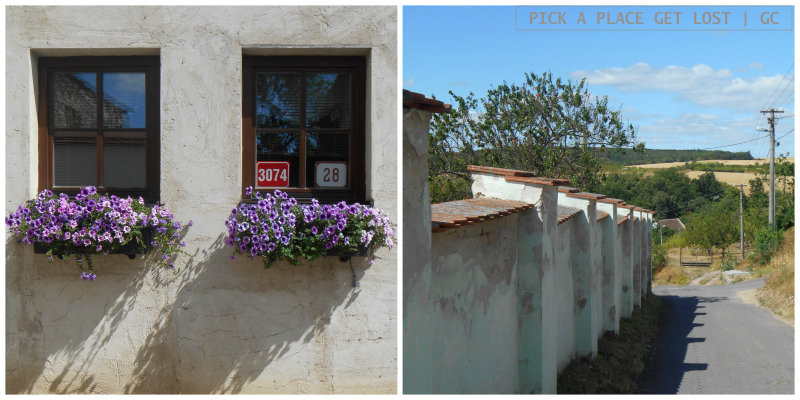 Šobes is one of the oldest vineyards in the Czech Republic, and one of the best vineyard areas in the whole of Europe. It took me a while to realise I’d got there. (Which is not surprising in itself, because that’s what I do.) Thankfully, the signs were there to help, and help they did. Pod Šobesem is one of the quietest spots I’ve come across throughout my Podyjí hikes. The landscape in the area is idyllic in the most authentic meaning of the word. The river is just there, and you can stand (or sit) by it, and dip your feet in it. Or you can cross over the suspended bridge to the other side, and head further south – or make a left turn toward Sealsfiedův kámen (highly recommended). 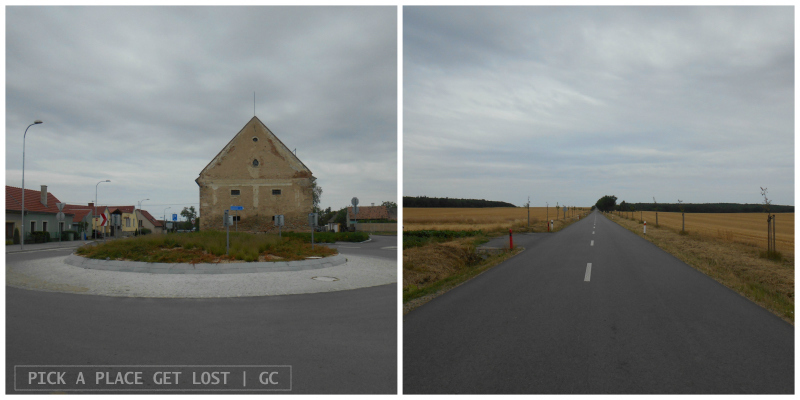 Masovická just shows how beautiful and non-ordinary a seemingly ordinary paved road can get. 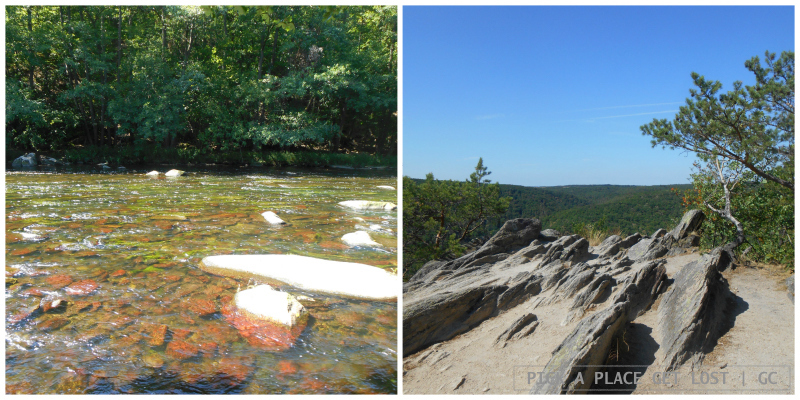 On my second hike, I went back up Hradistě, looking for some straightforward(ish) way to Podmolí and Lukov. An elderly woman took pity on the blank look on my face as I stood in front of the signs. She asked if I needed help. Huh, course I do. I told her I was looking for the actual road to Masovice, and she instructed me on how to reach it. A few minutes later, I was happily strolling down a seemingly endless road seemingly leading to nowhere. The sky was blanketed in clouds, with only random bits of blueish here and there, which made the air pearly grey. Both sides of the road were flanked by open fields, with signs on the left marking the border of the national park. Give it a few kilometres, and you will be welcomed to Masovice. PS. 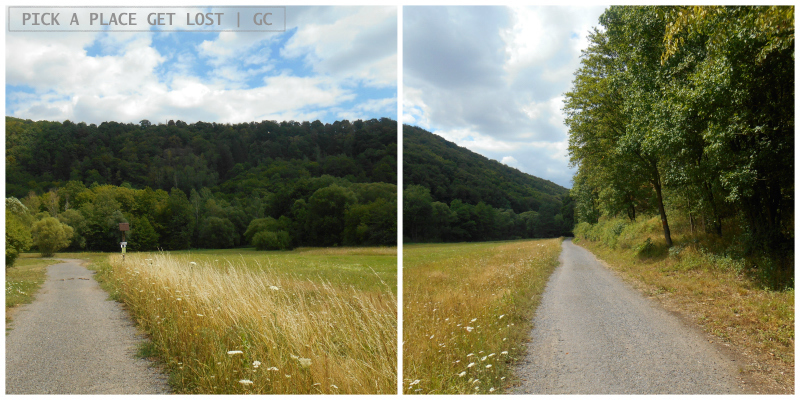 If you go hiking around Podyjí, most likely you won’t need to take this road. I did because I wanted to get to Lukov as quickly as possible with the aid of public transport. But it’d be unfair to say that it was merely instrumental to my trip plan, because I ended up truly enjoying every step. 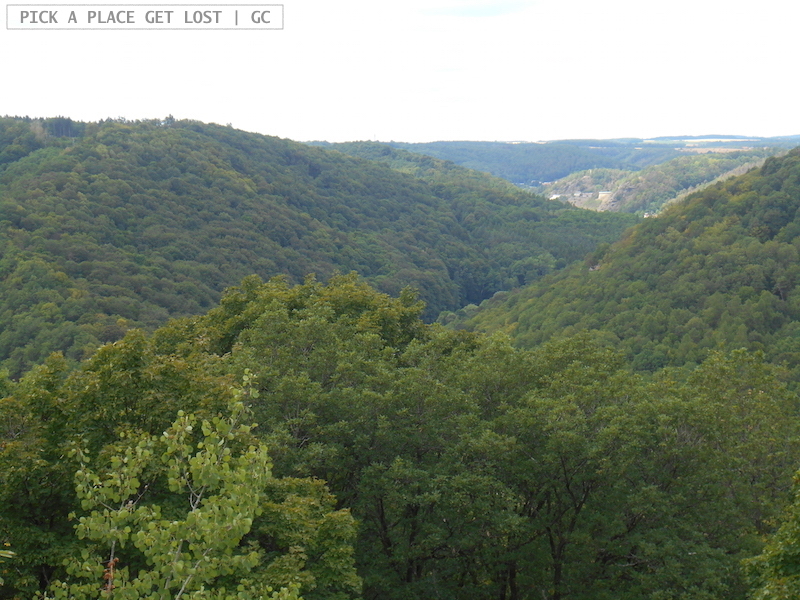 Well, that’s it about Podyjí National Park, and enjoy the hike! 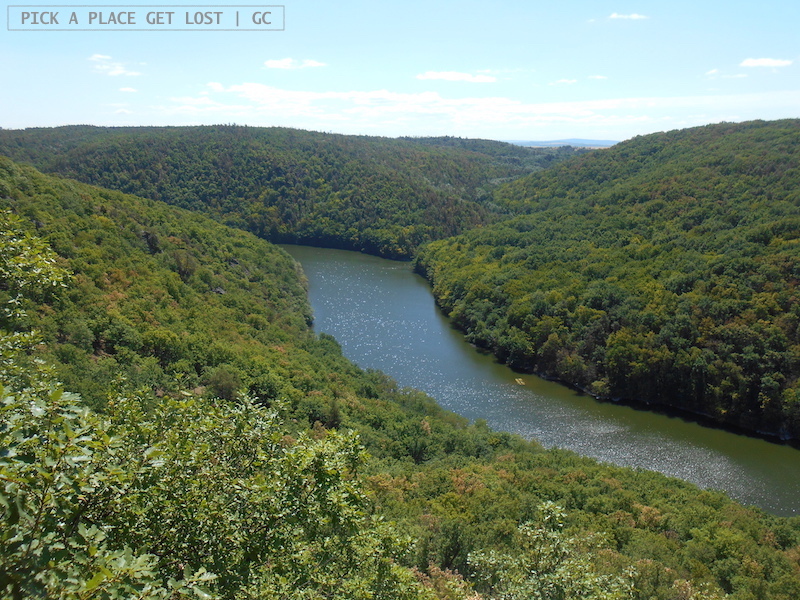 This entry was posted in Czech Republic, South Moravia and tagged czech republic, hiking, national parks, podyjí national park, south moravia, vranov nad dyjí, znojmo by Giorgia. Bookmark the permalink.